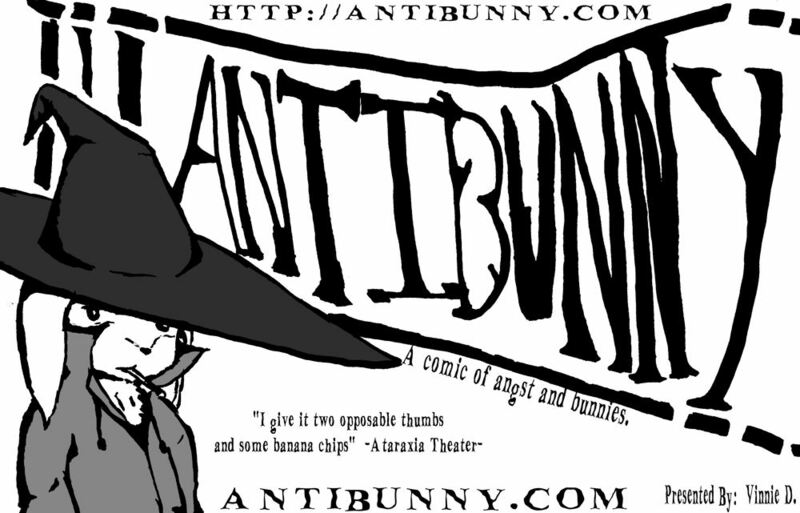 AntiBunny is a webcomic about a world in which talking rabbits have appeared and began moving into human society. These rabbits though not human behave humanly and face challenges with trying to live alongside another sentient species. AntiBunny is split between two stories. The original story which I also refer to as "Gritty City Stories" circling around Pooky Bunny and company, which circles around trying to simply get by in a harsh world, without any understanding of why they are there. Then there are side stories, mostly centering around the "Nailbat" story. Starting two years before Gritty City stories, Nailbat circles around one rabbit, by the name of Mors whom takes up the fight against anti rabbit hate crimes and becomes the first rabbit super hero. Gritty City Stories updates every sunday, and Side Stories updates every thursday. Between the two are a myriad of characters whom frequently appear in both stories. Antibunny got its start as a dream. A dream about an apathetic, chain smoking lop eared rabbit, who's fed up with the world. A dream turned into a late night scribbling, and that turned into the first comic. Over the next several days I continued making strips and soon enough the days had turned into weeks, and the weeks into months. A year after that half concious scribbling I resolved to make the comic I called at the time Sad Bunny, though later renamed to the catchier AntiBunny, known to the world. This isn't my first foray into the world of webcomics as I also created the long running, though sporadically updated UBERGEEK: The Comic and its spinoff Sprite World. 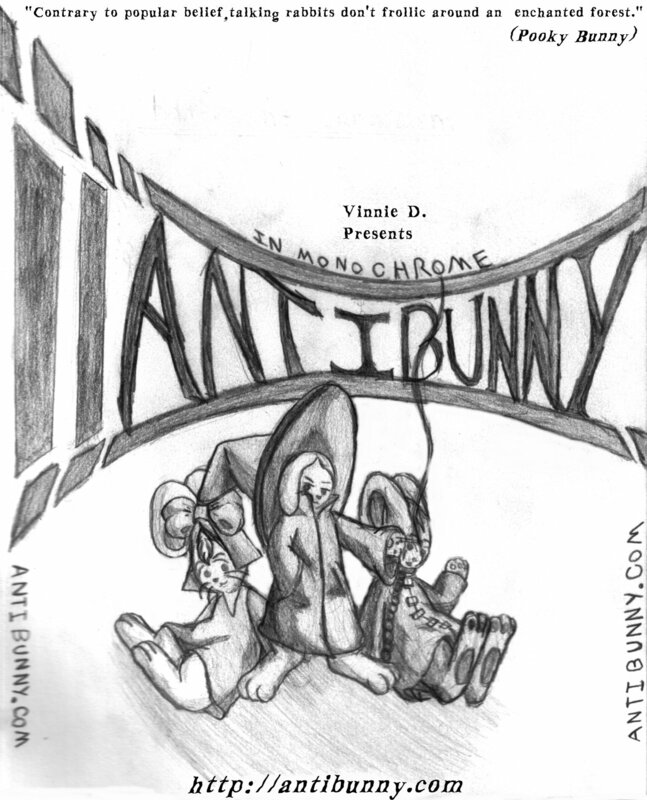 Antibunny is more of a pure artistic vision and an attempt at an entirely new style. The ever expanding cast of rabbits, the setting of Gritty City, and an angst-humor style of writing, all in place I hope you enjoy my comic. If you don't then sod off and read something else. AntiBunny is set in a world much like our own. It occurs in a non descript state within the US, in the city of Gritty City and its surroundings, which are encircled by natural barriers, Mountains, Rivers, and Dense Forest, accessable only by one lone highway. Gritty City is inhabbited by an unusual group of individuals though. That being talking rabbits. No one knows where they came from, not even the rabbits, but they've integrated into society and are now trying to live their lives, though much of the human populace of Gritty City has no love for them. Neighboring Gritty City to the south is the small town of Haunted Junction which exists in a shady region known as "Swamp Bottom". In Jaunted Junction the strange has become mundane, and spirits, demons, and mythological cretures coexist with rabbits and humans in what is otherwise a strangely normal society. To the east and across "Gritty River" is a thickly forrested nature reserve where the rabbits founded their home town "Petersburg." Most of them live either there or in Gritty City though some have spread out around the world. In most part the world of AntiBunny shares our own history, save for a few unusual facts. In the late 19th century superheroes began to appear. This continued through a few generations from post civil war, and through both world wars with the last supers retiring or dying out shortly after. Just after the end of what is called "The second age of Heroism," Talking rabbits began to appear in the world. It wouldn't be until the 1970's when they began living alongside humans. Otherwise all wars, and major historical events occurred very much like the real world. A look around the AntiBunny world however proves it far stranger. Those with the right sensetivities realize that ghosts and hauntings are quite real, Magic exists in secret circles, Aliens have visited earth regularly, and bigfoot is likely roaming around somewhere. Still society in general politely ignores these oddities and goes about business as usual. Artisticly Antibunny is always an experiment. I'm attempting to make a visual style that can be unique to this comic. A few defining features are thick outlines on characters, and traditional use of ink brush for shading and coloring. Stylistically it draws from Hardboiled style and Film Noir visiuals, though not as strict on the use of black and white as hardboiled style and becoming quite colorful. The amount of color and style of shading depends upon the mood that the scene calls for. To make a strip I work in stages. First I build a rough chain of events in my head with a fairly flexible script. I next lay out panels to fit the sequence of events and fill them with quick gesture drawings as I go. After that I'll go back and fill in the pencil work. I sometimes do one whole strip before moving on but usually I pencil several strips in a row to get the sequence of events down when they're still fresh in my head. The real work comes at the start of inking. Panels are inked entirely using an ink brush pen allowing for maximum control over line width with a single tool.Once inking is done I use a kneaded gum eraser to remove the original pencil work and begin shading. Shading was once done with pencils, however more recently I've moved on to an entirely ink centric style, which uses gray inks and brush pens, to create a smoother, but still organic feeling image. I preffer to use copic brand pens. The actual text and baloons you see are added in image editing after I've scanned. The main reason this is done in digital is simply because my own handwriting isn't fit for reading, I'd otherwise do it traditionally as well, but some sacrifices in style have to be made for functionality. Writing antibunny is one part making it up as I go along, and one part long running master plan. I've put together an extensive backstory that I plan to reveal very slowly to entertain (torture) my audience with, while at the same time I start new chains of events based on ideas that I have along the way. Keep reading to see where it all goes. Want to make the comic more popular? Well the obvious way to do that is tell people. Word of mouth is the best advertising there is. But if you want to do more you can alwyas throw a link to the comic on your website. You can also do a little live action advertising. When you go out into the big blue room, print out a few of these Flyers: flyer 1, flyer 2 and stick them most anywhere you think peaople will look. AntiBunny also now has a Business Card which you can also print out. Recommended to print at 3x2inches at 300dpi. You can fit 6 to 8 of them on a page. Furthermore if you post a flyer or bussiness card and take a picture. Email that picture to me and I'll post your picture on the front page and plug your website while I"m at it. Of course you can always click that donate button and send a few bucks to pay for art supplies, domain, and advertising. If you send a donation of $1 or more you'll get a free antibunny wallpaper of your choice. You can also click that little vote button on the left, when you come to visit. It'll up my listing on topwebcomics and lead to a few more people finding this little comic of mine. Last but not least, the best thing you can do is to keep reading yourself and let me know what you think. I always love hearing from the readers. The animal commonly called "rabbit" is of the familly Lagomorpha which also includes Hares, Jackrabbits, and Pikas. Yes there is actually an animal called a Pika, and yes it does look like what you're thinking but this is about rabbits. Until the early 20th century Rabbits and other lagomorphs were incorrectly considered rodents. Lagomorphs are now identified by their unique teeth. Lagomorphs have the same upper and lower, continually growing incisors as rodents but also have two pair of canine like peg teeth further down the jaw, which rodents don't have. Lagomorphs are distant relatives of Rodents, but not rodents themselves. Rabbits are differentiated from Hares primarilly by how they raise young. Rabbits are born blind and hairless and don't really resemble the wide eyed fuzzy animals we associate with rabbits until they are around 10 days old. Rabbits generally keep their young in burrows or nests depending on the species. Hares are born more developed with fur and open eyes. Hares are usually raised in the open. Jackrabbits are actually closer to hares than rabbits. In the wild rabbits are herbivarious, feeding on roots, wild plants, and the occasional garden if they should stumble upon one. Rabbits both forage for food in the open and can dig for food underground. Against predators a rabbit defends its self by hiding or running away, or can inflict painful bites and scratch with the claws on its powerful hind legs. Rabbits are known for their large feet, strong hips, short fluffy tails and of course long ears. However not all rabbits have long ears. Certain wild species have quite short ears. Rabbits have five digits on their front legs and four on the back as well as a dewclaw on the back of the foot. Notice I just draw three digits on either. It's just a matter of three digits being easier to draw. Most all cartoonists draw animals with three digits. Rabbits have been domesticated since the middle ages for utillitarian purposes (food, fur, or wool), however in the 19th century Rabbits being bread for show and companionship began to appear. Though not as common as cat or dog shows, rabbit shows are also still held to this day. All domestic rabbits are decendants of the european cottontail. If you're looking to adopt a pet rabbit, please go to your nearest animal shelter, rather than using a pet shop, or rabbit mill. A reputable, licenced breeder is also a good option, but please choose a method that does not support the breeding of rabbits as throwaway pets. Whatever you do DO NOT purchase an easter season rabbit sold on the roadside or parking lot. These rabbits often have medical problems leading to short lifespans, and buying from these unreputable breeders encourages them to continue the cruel practice of breeding rabbits as throwaway pets. For more information see The ASPCA or The House Rabbit Society. If you'd like to help rabbits but can't take on the responsibillity of adopting one you may consider doing some of the following. If you own a cat and live in a rural or suburban area, please keep your cat inside or closely monitored when outside. Cats are natural predators of young rabbits, and can't be trained to leave them alone, as their natural instinct will drive them to hunt even if they aren't hungry. This is also healtheir for your cat as it will be less likely to be injured by an animal or vehicle, and come into contact with fewer disease carrying vectors. Do not buy rabbits from a petshop, or streetside, or parking lot breeder. Furthurmore discourage your friends from doing so and direct them to an alternative, such as an animal shelter or reputable breeder. Making the argument that the rabbit they get will be healthier and live longer is often effective. Do what you can to discourage roadside and parking lot selling of rabbits. These breeders are unlicenced and often guilty of voilations of animal cruelty laws either intentionally, or by indifference. Although confronting the seller is certainly not recomended, safer alternatives such as notifying the ASPCA if you see any injured or sickly rabbits, discouraging others from buying, or in the case of a parking lot, attempting to convince the property owner to shut down the seller are all safe and legal options. DO NOT! pick up or attempt to adopt an abandoned wild rabbit baby. Rabbit mothers DO NOT abandon their young. The mother is likely off foraging for food and will return later. Mother rabbits are very confident in the safety of their nests or burrows and will leave the young unatended for long periods of time in order to search for food, but they will always return. Find a local animal shelter that keeps rabbits and donate or volunteer. Even a small amount helps if everyone pitches in. If you find an abandoned domestic rabbit either notify the human society, or you can attempt to adopt it yourself if it's friendly enough. Please make sure it's a true domestic rabbit though, and not simply a wild rabbit that's lost its fear of humans. Domestic rabbits due to selective breeding often have solid color coats, wheras wild rabbits have course patchy coats. Of course floppy ears are a deffinate sign of a domestic rabbit. Feral domestic rabbits should be removed from the wild as they are a seperate species from the american rabbit (or wild rabbit of whatever region you live in) and can not intermingle with the native population. Sometimes abandoned domestic rabbits will gather in groups, If you should find one of these collonies notify your local branch of the humane society and the ASPCA. You're going to need help rescuing all these bunnies. Additionally this may be a dumping ground for those whom have purchased rabbits as throwaway pets, and those responsible if cought in the act can be charged with animal cruelty. If you are a hunter please research carefully the ecology of rabbits in your area. Rabbits may have a reputation as fast breeders but wild rabbits do not have the luxuries a domestic rabbit does and already have a number of both natural and unnatural predators. Unlike deer whom have practicly no natural population controls, outside of humans, wild rabbit populations may already be strained, and certain species of rabbit are threatened or endangered. Please choose another animal to hunt, which has a stronger wild population. In the unlikely event you've found a rabbit nest in your yard, marking it with one or more bright orange posts (or just some orange tape around a wooden post) is recomended. so you and others on your lawn will know to avoid damaging the nest. Just avoid it when mowing and wait for the buns to grow up (in about 3 to 9 weeks depending on the species) and move out. Rabbit's don't re use nests or burrows and won't come back to this one, so it will be safe to take it down. If you do accidentally disturb the nest try to reassemble it using grass and whatever original materials you can find, including bits of fur. If you should have accidentally killed one or more of the babies, it may sound macabre but leave the body behind. Rabbits don't equate missing babies with deceased ones, and if you remove the body the mother may begin franticly searching for her missing baby. If you leave the body she can realize the kit is dead and accept it. She may move her familly if they're old enough, so if they all dissapear be watchful of new nests incase she didn't move far enough away. When it comes to rabbit nests and lawnmowers, if you have such high grass that you couldn't see a nest, you need to check your lawn carefully before mowing. There may be other things that could damage your lawnmower or cause you injury laying around anyway. Not to mention you could be disturbing ground nesting birds, foxes, snakes, and hornets. And you deffinately don't want the latter two mad at you. Rabbits are most active at dawn and sunset, and that's when you're most likely to find them crossing roads. Rabbits are active year round so if you find yourself driving around these times on rural roads, slow down a bit and don't let yourself get distracted. You might be saving yourself from an accident as well. By drving slowly, you can give yourself time to brake, rather than swerve and risk an accident. And there you go. More than anyone would ever want to know about rabbits. 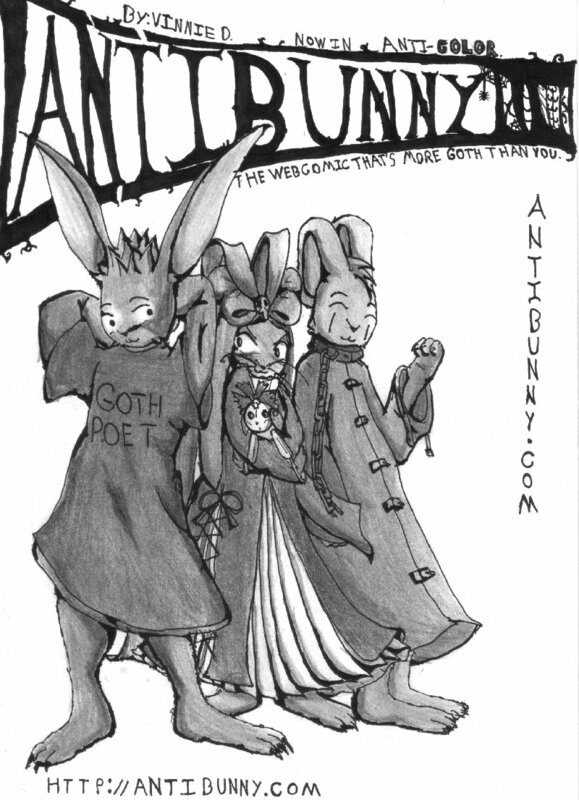 AntiBunny is hosted on Keenspace, a free webhosting and site automation service for webcomics. They're pretty keen, if I do say so myself.